The recent APEC Conference in Sydney put on show the logic that governs preoccupation with national security. It revealed that logic to be costly, ineffective and corrosive of the human values it claims to defend. The problem lies in the desire to guarantee total security. This means that every possible threat has to be identified and explored, every possible protection installed. At APEC protection cost $260 million dollars. When you want total security you necessarily focus on the threats to it. Before APEC we heard much about the danger of terrorism and even more about the danger of violent demonstrations. We knew that the guardians of security were ready for both, come what may. The total security project, however, is marked by paradox. The security apparatus necessary to meet all imaginable threats is so complex that it subverts itself. It creates a climate in which sloppiness or even ordinary human common sense can both undermine the conditions of a reasonable security and corrode the values security defends. At APEC the Chaser saga perfectly demonstrated the paradox. 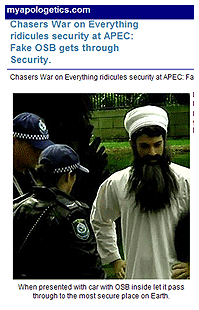 The Chaser team, complete with Bin Laden look-alike, were waved through a series of checkpoints. Those responsible for security then warned them that they could have been shot by a nervous sniper. The effect of security was clearly to create an insecurity that could have led to the loss of innocent lives. The paradox was also illustrated in the case of Dr Haneef. Preoccupation with security led him to be detained. But the same preoccupation led to sloppiness and partiality in presenting and publicising evidence. The process was inconsistent with the respect for human dignity that security was supposed to defend. This logic naturally brings the quest for total security into disrepute. It suggests that we cannot and should not attempt to guarantee total security. But in the logic of total security such failures are seen to demand an iron-cast security system. Such a system would demand protection against its victims — heavier penalties for trespassers and whistle-blowers, more secrecy to prevent confidence being undermined, provisions to prevent security’s victims from being known. It would also rely on public fear of threats to security. Respect for humanity will finally be diminished by the security devised to protect humanity. This logic is evident in germ in Australia. Its fruits can be seen fully in the history of nations like South Africa. There national security became a priority at the start of the apartheid era. Its early implementation was characterised by clownish performances early in the regime that mistakenly led it to be laughed at. But gradually it came to be supported by secrecy, arbitrary power and an ideology of vigilance. This eventually led to a profoundly inhuman regime. The logic of security has always led Christians into conflict with the state. From the beginning Christians found themselves at odds with Roman power. The Book of Revelation depicts in powerful imagery the incompatibility between the Roman politics of security and Christian faith. Augustine later characterised the Roman genius as one of military conquest, adding that all wars are waged in order to secure peace. By peace he meant security, the desire to control the world in a way that protects the nation from risk of harm. For Rome this meant a policy of imperial expansion. Augustine contrasted this desire for a peace enclosed in this world with the Christian desire for a peace beyond this world. The broader perspective enabled people who lived by faith to accept the relative lack of security and vulnerability that are inherent in human life. Augustine, whose North African homeland was invaded by Vandals, did insist that nations have a duty to provide a reasonable degree of security. They were to provide a predictable space in which people could live their lives. They could focus on the important matters of life and death that ran beyond this life. This approach focused attention on the dignity and preciousness of each human being. The logic of respect for human dignity includes attention to security as one element. But it excludes subordinating human dignity to the demands of total security. Australian Christians should find difficulty with the present emphasis on security, and with its internal logic. It regards the human dignity of selected persons as dispensable in order to secure security in all contingencies. Once respect for vulnerable human beings is regarded as optional in the search for security, the human dignity of those offered security becomes equally dispensable. a wonderful article. can one apply this logic now to border security and issues of political or environmental refugees seeking to enter australia in years to come? - not so different perhaps in nature to st augustine's encounter with the vandals, who were "moving in" to Roman Empire space rather than "invading" it.the total security approach would suggest disruption of travel, sinking or sabotaging boats so people in them cannot reach Australia . A respect for human dignity, reasonable security approach suggests a different and more compassionate mix of policies. Well said, Andrew. There is no such thing as total security and our own security is often best served by enhancing the security and well-being of the other. Besides, the pursuit of "total security" leaves no place for trust, a quality that is essential if we are to live in any sort of civil relationship. it is a curious coincidence that a few days after this article, AFP Commissioner Mick Keelty in a major public address referred to climate change refugee flows as a larger looming Australian national security issue than terrorism. His wording was quite Delphic. I do not know whether he was simply making a general point that climate change must now be high on the list of national security issues to be taken into account in government policymaking - a proposition all reasonable people would accept. 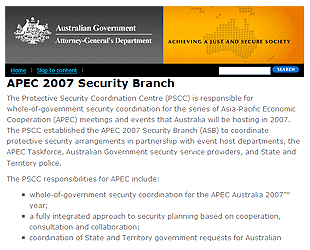 But there is a more disturbing interpretation - that Keelty was hinting that under the AFP's mandate to combat international organised crime, in which list the AFP includes "people smuggling", the AFP now must plan and be resourced to discourage and disrupt unregulated flows to Australia of people displaced by climate change. If the latter were his meaning, he should come out and say so clearly - instead of dogwhistling to those in the know. The time is coming when greater clarity will be expected of senior public servants on such matters. Superiority and the benevolence of modern science and the health-care system, versus the cruel, more ancient practice of ostracising the sick from civic life.